While bandwagon jumping is relatively harmless as a sports fan, it can be a costly practice as a trader. Chasing a market on a juicy piece of news can be tempting, but it often puts you at an immediate disadvantage—that is, it can cost you your edge. 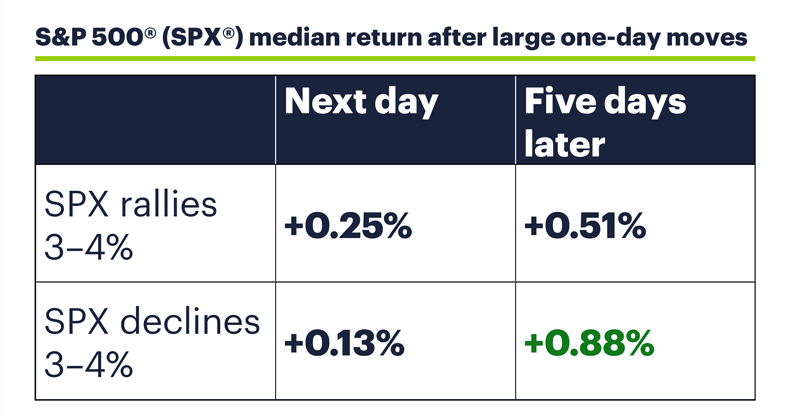 One day later, the SPX was typically up a little more after the big up days than it was after the big down days, but after five days, things were reversed: The index was up only 0.51% after the 3-4% up days but up 0.88% after the 3-4% declines, a reminder that when all is said and done, when you chase momentum, it can sometimes end up chasing you. And in certain situations, the loss of edge can be much more meaningful. For long-term investors, this isn’t necessarily as much of a problem, since over a 10-year or longer holding period, the edge given up by going long on a breakout vs. a pullback will often be insignificant. So, on a day like yesterday, when the SPX opened 1.1% higher and quickly rallied to around +1.5% amid enthusiasm surrounding the temporary ceasefire in the US-China trade war1, a long-term investor who bought near the intraday high may not have been too perturbed when, a couple of hours into the session, the market had given back nearly two-thirds of its intraday gain (probably wasn’t happy, though). But a trader working on, say, a one- to five-day time horizon who got long expecting even larger immediate gains—it was such a bullish macro story!—may not have been so laid back about how the day was unfolding. To compound the problem, strong trends can bail traders out of less-than-stellar decisions, which reinforces bad habits. Many traders jumped on moves to new highs during the hottest stretches of the 2017 and early 2018 stock market rally, and were often rewarded with quick gains and minimal (or non-existent) downside heat. When the market isn’t in a strong trend, though, such casual trading can be rewarded with short-term aggravation and losses because follow-through is much scarcer. The lesson isn’t that it’s never a good idea to buy breakouts, but that context matters—and that context can sometimes present additional trade possibilities. For example, yesterday tech hardware company Xilinx (XLNX) opened up 2.7% at an 18-year of $95, but quickly sold off to $92.62 (still up on the day, though). 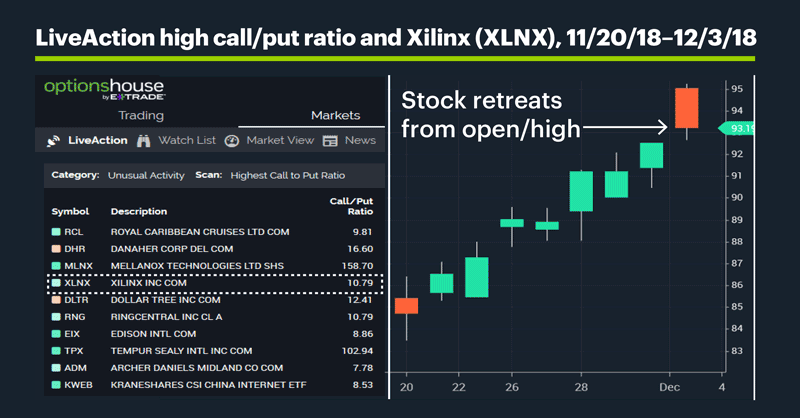 Also, the stock was high on the LiveAction call/put ratio list, which some traders may have interpreted as a sign of a possible near-term bullish sentiment extreme, given the stock’s recent runup and intraday pullback. Long-term investors may have many more years of XLNX gains ahead of them. Short-term traders may have seen an opportunity to take advantage of a potential cool-down in share prices, either through stock trades or perhaps selling call options that were pumped up by the rally. There are two sides to most news stories, as well as trades. Today’s numbers: Motor Vehicle Sales, Australia GDP. Reminder: US markets will be closed tomorrow (Wednesday) to honor late President George H.W. Bush. Today’s earnings include: AutoZone (AZO), Dollar General (DG), Guidewire Software (GWRE), Hewlett Packard Enterprise (HPE), Ollie's Bargain Outlet (OLLI), RH (RH), Toll Brothers (TOL). 1 Economist.com. The US-China trade war is on hold. 12/2/18.